Negotiations between Iran and the United States over the release of the 52 American hostages appear to have reached a standstill. In part, this has happened because the Tehran government lacks cohesion; top leaders make contradictory statements and it is still not clear who is in charge. But part of the blame rests squarely with the Carter Administration and its confusing approach to the hostage crisis. 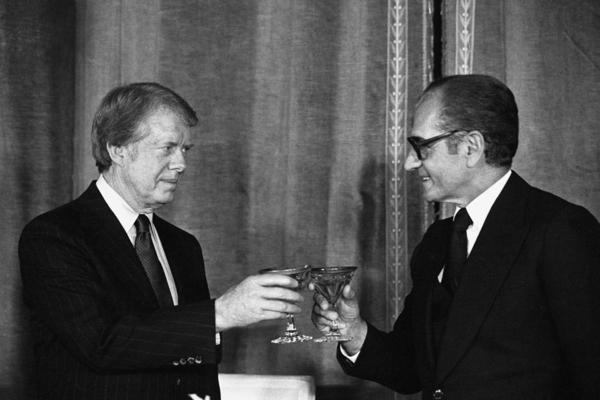 How the revolution started: Jimmy Carter and Mohammad Reza Pahlavi toast the new year in Tehran on December 31, 1977. The Carter Administration continues to hedge and waver over the hostages. Rather than select a single policy and pursue it steadily, President Carter has juggled several goals at once and reordered his priorities at will. This tendency to strive for many things at once – some of them mutually exclusive – has bedeviled relations with Iran ever since the hostages were seized. Washington has been torn among three priorities, three strategies, and has been unable to commit itself to one. The release of the hostages has been delayed because Carter cannot decide whether the safety of the hostages, the honor of the United States or geopolitical considerations are paramount. When Carter has focused on safety, he has made it seem that the return of the Americans would take precedence over all else. But the problem with that approach is that to guarantee their safety the United States would have to yield to virtually every Iranian demand, and no excuses would disguise the fact that we were capitulating. Sometimes, as the emphasis has shifted to upholding the national honor, Carter has behaved as if the United States would have nothing to do with Iran until all the hostages came home. After all, he has seemed to say, our principles are at stake. As long as the Iranian government continues to abuse Americans in flagrant violation of all accepted customs and laws, Carter has implied that he would apply unrelenting pressure on Tehran – boycotting its oil, freezing its assets, withholding military aid. The geopolitics of the Middle East has been another priority for the U.S. government. Despite the hostage crisis, the United States has a continuing interest in the stability and security of Iran. These considerations imply that we should ignore the hostage problem support the Iranian government in its war with Iraq. Recognizing our interest in Iran, the proponents of this strategy would have the United States end economic sanctions, supply arms to Tehran and encourage Iranian aid to the rebels in Afghanistan. They would take these steps without thought of the hostages; that is, the United States would provide this support to build up Iran, not because it might lead to release of the Americans. Because of concern over Iran, we in fact have lent it limited diplomatic support (labeling Iraq as the aggressor), held back from imposing a naval blockade and forsworn further military action. In evaluation these three strategies, it is clear that the approach that puts the safety of the hostages first is unworthy of serious consideration. As our allies have often pointed out, the United States as a great power cannot organize its foreign policy in this manner, least of all one whose global interests affect all mankind. The lives of the hostages must not take precedence over concerns of nation principle and security. Principle is involved because the United States has long refused to deal with extortionists. Whoever holds the gun to our heads must not gain from doing so; if one terrorist succeeds we invite further acts of terrorism. Security is involved because agreeing to Iran's terms places us willy-nilly on its side in the conflict with Iraq. If the hostages' safety is eliminated as the top priority, that leaves the approaches that emphasize honor and geopolitics. Both strategies, unfortunately, have deep flaws, making any choice between them agonizing. Emphasizing preservation of the national honor, at the expense of everything else, ignores vital strategic interests. Iran, a key nation located between the Soviet Union and the Persian Gulf and adjacent to Afghanistan, contains vast oil and gas reserves of importance to every industrialized nation. If we ignore Iran's needs, we weaken that government economically and militarily, reducing the regime's resistance to domestic and foreign foes. But giving full rein to geopolitical considerations ignores American emotion. Even if it is wise to side with Iran against Iraq, the American people may not accept this act of Realpolitik. Authoritarian governments can adopt this sort of cunning approach with little regard for popular feelings, but in the United States any move to side with Iran would arouse bitter and divisive opposition. 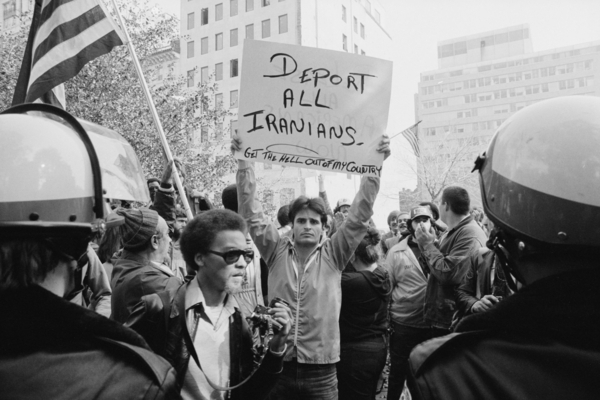 A Washington, D.C. protest in 1979 gives a sense of American anger at Iran. Each of these two strategies has clear problems: either we risk the possibility of yet greater turmoil in Iran or we passively accept humiliation. But, however painful the choice, the President must establish his priorities. This is exactly where Carter has repeatedly failed; he has never seemed to understand that is matters less what policy is adopted that that is be executed with consistency – and that is still true. Forced to choose between honor and geopolitics, I would opt for honor. A stand for dignity and principle would strengthen American self-confidence and improve our international standing. Friends and adversaries alike would respect such a position, especially after years of declining American credibility and constancy. In contrast, the gains from granting assistance to Iran are questionable. It is not even certain that the Iranian government would accept our aid. America has been anathema to Iran's revolutionary rulers since they came to power in January 1979, and nothing indicates that they have changed their minds. Opposition to the United States has unified the otherwise fractious Iranian government. Though not a pleasant role for America, serving as Great Satan might be our most useful function at this time. American offers of aid could even prove counterproductive: by forcing the government to decide whether to accept aid, we might create a crisis in Tehran and make Iran more susceptible to Soviet pressures. Helping Iran might also jeopardize our position in the Persian Gulf. When countries such as Saudi Arabia at last show signs of realizing that their first foreign-policy concern must be Gulf security, not the destruction of Israel, it appears unwise to abandon them for Iran. Our lines to Iraq should stay open right now, particularly in light of recent tensions between Syria and Jordan. Too much is going on at this moment in the Middle East for us to plump for Iran. Finally, it is not clear that in putting geopolitical concerns first we would actually be serving our long-term interests. Tricky maneuvering with Iran might win the United States a source of oil or a half-hearted ally, but these are secondary and uncertain gains. Iran could slip again from uncertain gains. Iran could slip again from our sphere of influence, this mocking our efforts. What is more important than short-term advantage is the American need to maintain a principled foreign policy. Thus, preserving the national honor should be our first priority in negotiations with Iran; we should have no dealing with that country until hostages are released. Putting aside matters of the moment in favor of reasserting fundamental U.S. values would provide President Carter with a dignified exit and give Ronald Reagan a proper start. Daniel Pipes, a historian at the University of Chicago, is the author of Slave Soldiers and Islam, to be published in January by Yale University Press.